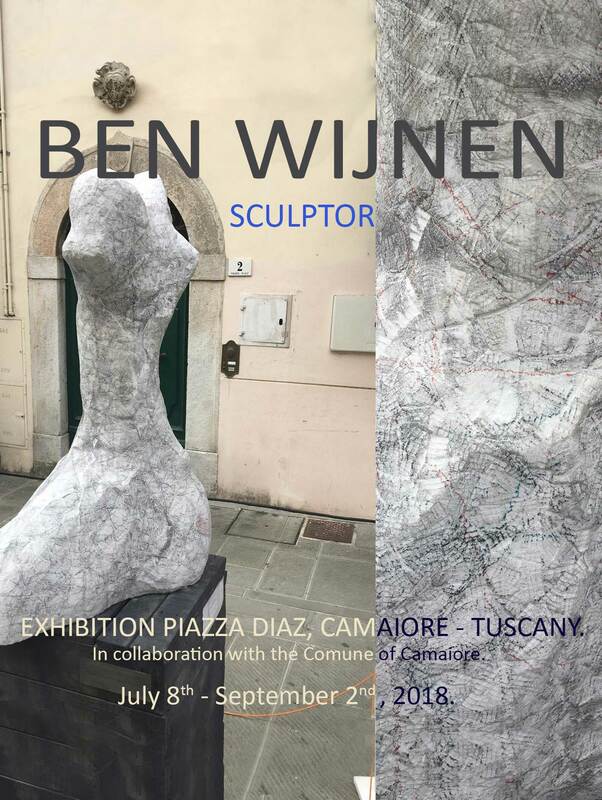 2018 Camaiore, Gallery & Studio Ben Wijnen / Italy. Personal exhibition, Marble & Bronze, Drawings. Camaiore, Piazza Diaz, Summer 2018 / Italy. 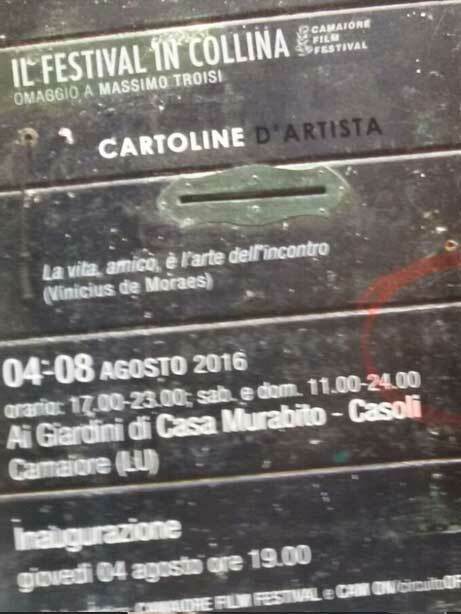 Marblesculpture "Rinascita / Rebirth", in collaboration with the Commune of Camaiore. 2017 Pietrasanta, Museo dei Bozzetti / Italy. 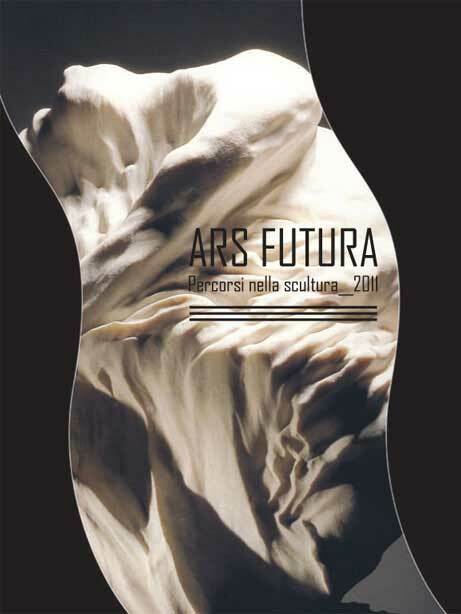 Leading sculpture museum at Tuscany acquires... of Dutch sculptor Ben M. Wijnen. Pietrasanta, Piazza Crispi, Summer 2017 / Italy. Marblesculpture "Rinascita / Rebirth", in collaboration with the Commune of Pietrasanta. 2016 Pietrasanta, Spazio Contemporaneo / Italy. 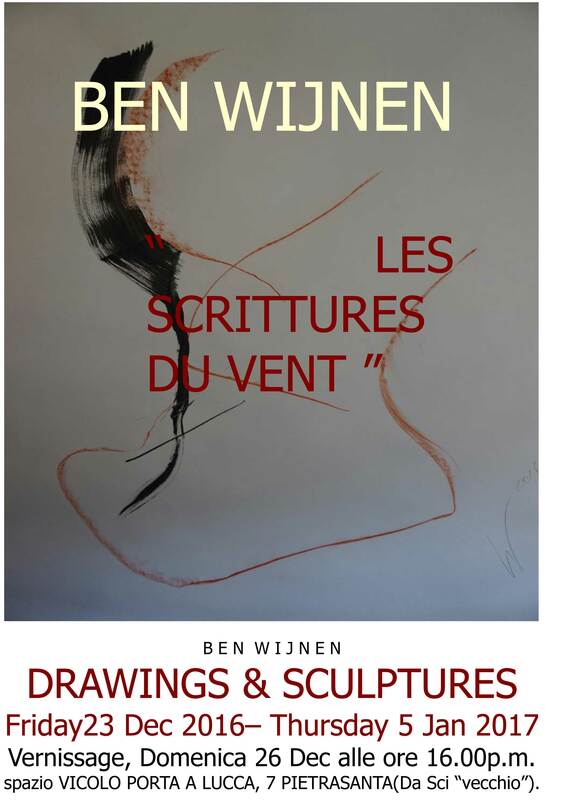 "Les Scrittures du Vent" - Personal exhibition - Drawings and Sculptures. Camaiore, Spazio Contemporaneo / Italy. 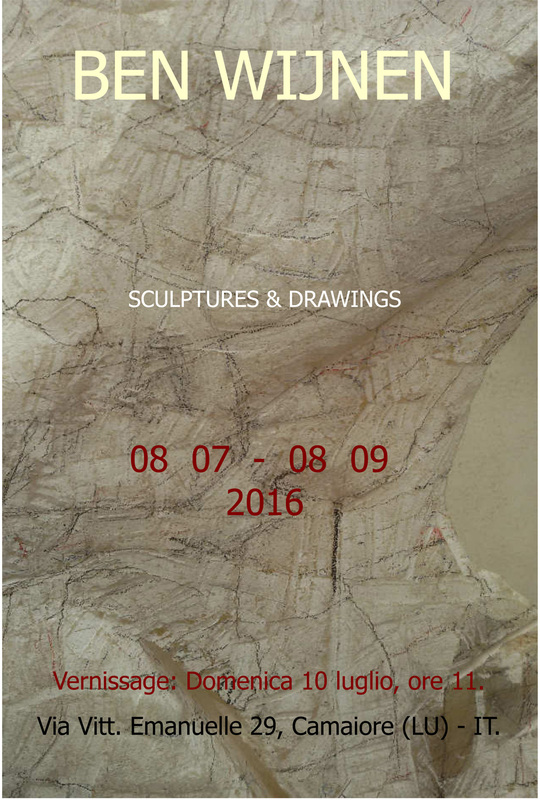 Personal exhibition - Marble & Bronze, Drawings. 2015 Amsterdam, Stg. Hendrick de Keyser / The Netherlands. "Open Garden Days" - Personal exhibition - Marble and Drawings. 2014 Oss, ECR Sibelius / The Netherlands. 2013 Pietrasanta, "Arte si Sente" - Spazio Centemporaneo / Italy. 2012 Lithoyen, Galerie Sous Terre / The Netherlands. Paris, Galerie Tournemine / France. 2011 Stiava/Massarossa, Villa Gori "Percorsi nella scultura 2011" / Italy. Pietrasanta, Galerie G.Bovecchi / Italy. 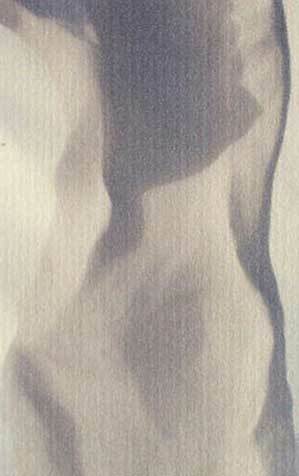 Collective exhibition - Marble and Drawings. Wijk bij Duurstede, Galerie DC Ahrens, The Netherlands. Pietrasanta, Galerie F.Panzetta / Italy. 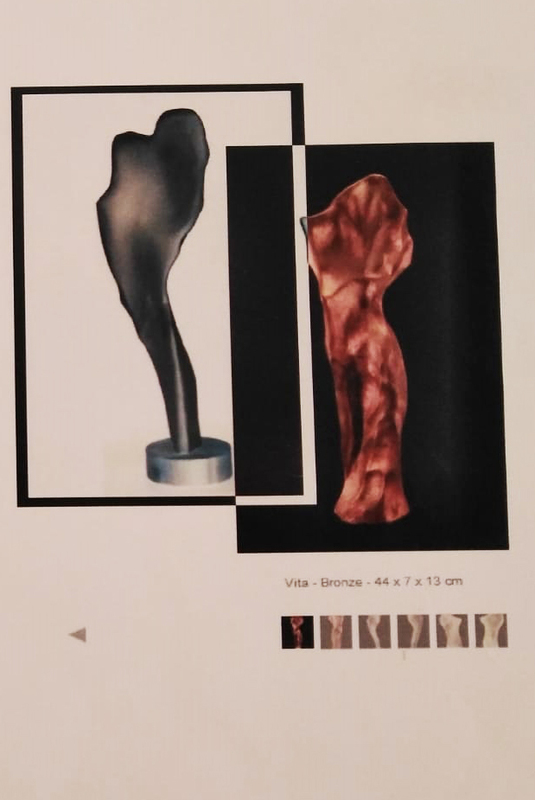 Collective exhibition - Marble & Bronze, Drawing. 2010 Wijk bij Duurstede, Galerie DC Ahrens / The Netherlands. Collective exhibition - Marble & Bronze. Pietrasanta, Spazio Contemporaneo "Levenszicht" / Italy. Personal exhibition - Marble and Drawings. 2009 Milan, Galleria Sabrina Landini / Italy. Goirle, "Art Meets Business" / The Netherlands. 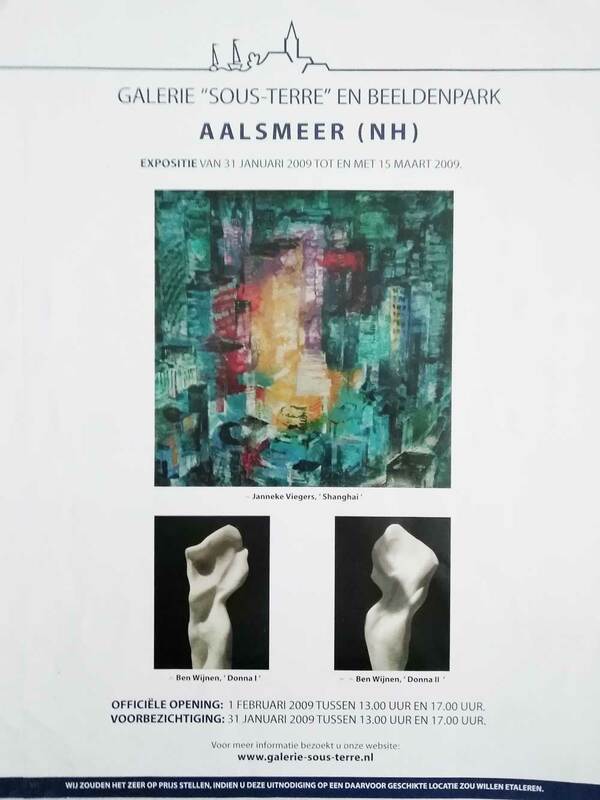 Aalsmeer, Galerie Sous Terre / The Netherlands. 2008 London, Gallery Fumi / United Kingdom. 2007 Wijk bij Duurstede, Galerie Mignon / The Netherlands. Paris, Espace Ephémère "les5sens" / France. Personal exhibition - Marble & Bronze. Paris, Théatre des Mathurins / France. 2006 Apeldoorn, Centraal Beheer / The Netherlands.